This paper explores the effects of unilateral tax provisions aimed at restricting multinationals’ tax planning on foreign direct investment (FDI). 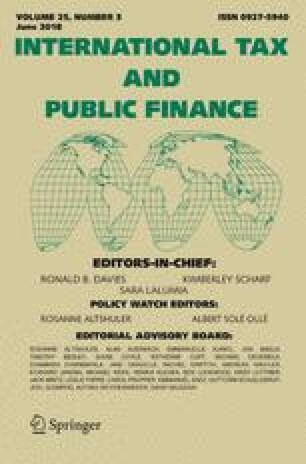 Using a unique dataset which allows us to observe the worldwide activities of a large panel of multinational firms, we test how limitations of interest tax deductibility, so-called thin-capitalization rules, and regulations of transfer pricing by the host country affect investment and employment of foreign subsidiaries. The results indicate that introducing a typical thin-capitalization rule or making it more tight exerts significant adverse effects on FDI and employment in high-tax countries. Moreover, in countries that impose thin-capitalization rules, the tax-rate sensitivity of FDI is increased. Regulations of transfer pricing, however, are not found to exert significant effects on FDI or employment. We thank seminar participants at the Oxford University Centre for Business Taxation, at CESifo, Munich, and at the Free University of Berlin, for helpful comments. Data access by the Deutsche Bundesbank and financial support by the German Science Foundation (DFG) is gratefully acknowledged. Micro-level data are taken from the micro-level dataset (MiDi) of the Deutsche Bundesbank (see Lipponer 2011, for an overview) using a version that covers the period from 1996 to 2007. Corporate taxation data are taken from the International Bureau of Fiscal Documentation (IBFD) and from tax surveys provided by Ernst & Young, PricewaterhouseCoopers (PwC), and KPMG. The statutory tax rate variable contains statutory profit tax rates modified by restrictions on interest deduction—as in the case of the Italian IRAP. For details on the tax rates used, see Table 5. Thin-capitalization rules Basic information about thin-capitalization rules has been obtained from the same sources as the tax data. As in Buettner et al. (2012), this information was augmented and cross-checked with questionnaires sent out to country experts of PricewaterhouseCoopers. Table 6 provides the safe haven debt-to-equity ratios. Transfer-pricing regulations are taken from the study by Lohse and Riedel (2013) who provide a classification of the strictness of national transfer-pricing regulations, see Table 7 for details. The empirical analysis basically focuses on a binary variable, which is unity if the transfer-pricing regulations are categorized in the two top classes (class 4 or 5). Macroeconomic indicators such as GDP and GDP per Capita in US dollars, current prices, as well as GDP Growth and Inflation are taken from the IMF World Development Indicators. Heritage indicators ‘Financial Freedom’ and ‘Freedom from Corruption’ are taken from the Heritage Database. Scores range from 0 to 100.